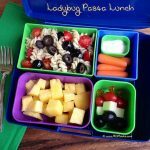 Ladybug Pasta School Lunch - MOMables® - Good Food. Plan on it! 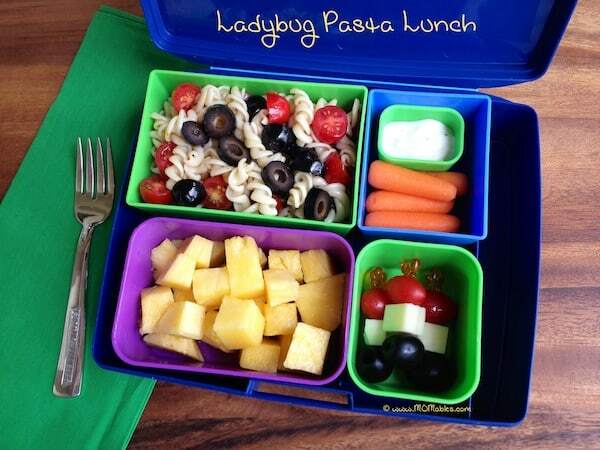 Ladybug Pasta School Lunch - MOMables® - Good Food. Plan on it! What all do you use olives for? Black olives are not just for pizza; they go with everything! Their sweet flavor is one my daughter loves, and the health benefits are a big bonus. We typically go through a can or two per week. Seriously. 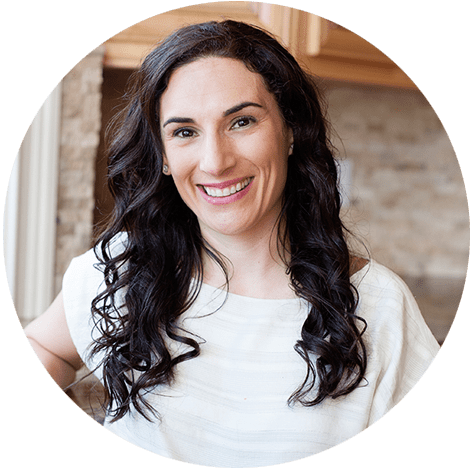 Olives are a staple in my house—I am from Spain after all—and we do eat a fairly typical Mediterranean diet. My daughter eats them right out of the can while I am trying to slice them to top our pizzas, enchiladas, tacos, burritos, dips, salads—yes, we are an olive-obsessed family. Since this is a school lunch site, why not show you one of my daughter favorite ways to bring them to school? We’ve had this lady bug pasta salad in our MOMables menus for over a year, and it remains a favorite. Makes 1 or 2 lunch servings, depending on portion size. Alternate skewering the tomatoes, mozzarella, and olives onto rounded-edge food picks. 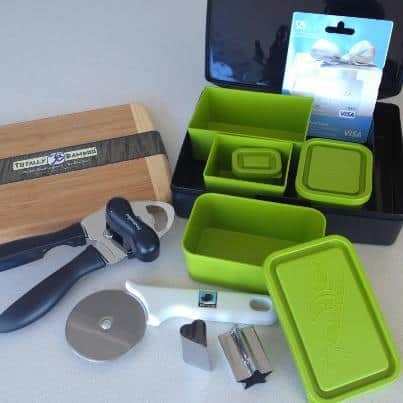 Our friends at California Ripe Olives know we are serious about lunch packing, so they’ve offered to give away a California Ripe Olive bento set! CONTEST IS CLOSED. Our winner: Erin -myhappilyeverafter. Congrats! Thank you Little Daisies for the inspiration. my daughter LOVES olives… she takes them regularly in her lunch, mainly in salads… she has them in her lunch today! Straight out of the can…or off their fingertips LOL! My son loves them on pizza and pasta!! We like them best in pasta salad. my son loves eating em straight from the can. I usually put an overload in my pasta salad. Yummy! My kids favorite way to eat olives are right off their fingers! My daughter loves olives just as a compliment/side to chicken salad or tuna salad on a cold plate sampler!!! We love olives in a fresh greek salad but we also have recently discovered how yummy they are in an olive tapenade… mmm!! My son loves them as eyeballs…on deviled eggs, sandwich faces, pizza faces, you name it. An occassional wheel olive has been enjoyed as well! My kiddos absolute favorites are Kalamata olives.. she loves Mediterranean flavors! But black olives on finger tips, garlic stuffed or traditional pimento green.. doesn’t matter.. they are all a hit! Z likes poking one onto each finger and eating them off again. On her fingers of course,lol. She loves to stick the black olives on her fingertips and then eat them off! I even remember doing that as a kid too! My kids love to put olives on each finger and then eat them off one by one! John LOVES black olives on his pizza, too! My son’s favorite way to eat olives is to stick them, whole, onto the end of his fingers, wiggle them around a little and then pop them into his mouth one by one. My kids love to eat olives FAST! Sometimes they peek through the holes or put them on their fingers, but mostly they just love to eat ’em up! We pack them in lunchboxes too and they are on of my favorite little things to put on a cute food pick or mini-skewer. My sons love to put whole pitted olives on their fingertips. It is the cutest thing! I love black olives with italian dressing and cold noodles! My son loves to eat olives just like I did when I was a child. Put one on each finger, pretend you are an olive monster, then eat them off your finger! Planning to start a nursery I D.C. where the First Lady Michelle Obama is behind healthy foods for children, from day one. So all these ideas come in handy. Plus I take care of my 1 year old granddaughter and she is a very healthy eater. Your ideas are wonderful, especially in a Bento Box. We eat olives in or on just about everything! The kids love to try and toss them into each others mouth! and yes 5 second rules apply when one hits the floor because no one wants to waste one! My kids love to put olives on their fingertips and eat them off, one by one! My kids would eat an entire can in the matter of seconds. They just like to eat them off of the tips of their fingers. :) They also request them on pizza a lot. Myra, this is a great idea!! thank you! My kids eat olives off their fingers! : ) it’s the only way they’ll eat them – I’m the real olive lover in the family! Mine loves them on pizza…or straight out of the can!! Our favorite way is in a cold salad!!! They place them on their fingertips and then they start eating them. My daughter loves olives! Eats them any way they are presented. They are in her lunches almost everyday. Our two year old loves to eat black olives on our homemade pizzas! My daughter loves them right out of the can and I love them in a pasta salad! My daughter loves to eat olive on her pizza but will eat them almost any way (including right out of the can). My kids will eat olives in a tapenade, but not yet whole … but it’s something to work on!